Walking is great exercise and light, family-friendly hikes are a fab way to get in shape and clear your head while enjoying some stunning vistas and reconnecting with your loved ones. With spring just around the corner now is the right time to start planning some weekend walks in nature, especially if you have spent most of winter indoors. 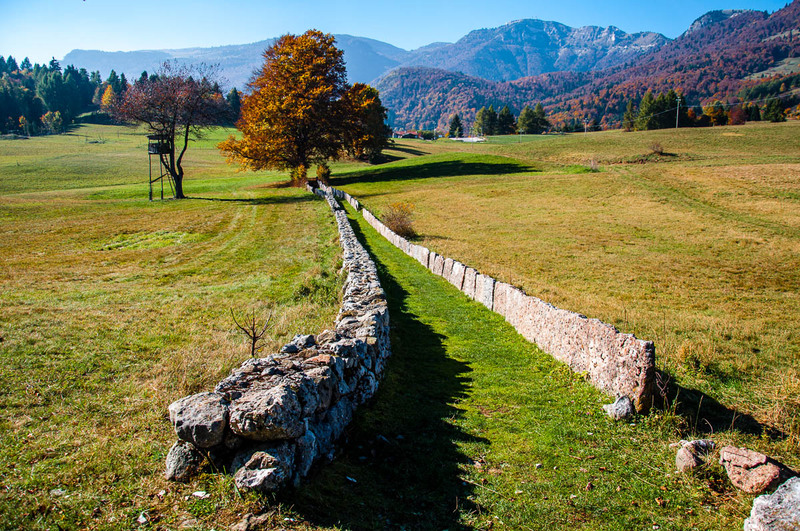 Well, for this purpose and to help you out here is the second portion of my exhaustive list with 20 family-friendly walks and hikes which are conveniently only up to an hour and a half from Vicenza. If you have missed the first part of this list, please, click here. Otherwise, do tell me which walks and hikes from those included in it you have already ticked off. Here is a huge ‘Bravo!’ and a strong pat on your back from me for your efforts. Anyway, a few words about the walks and hikes in this portion of the list. As before, all sorts of terrains are covered – flat and hilly, urban and remote, lake-side and mountain-side. It is advised to always wear comfortable clothes/shoes and to carry enough water and snacks to keep your energy levels consistent. All of the recommended herewith walks and hikes have been personally tried and tested by me and my family, so all is described from a first-hand experience. They are great to do as day trips and, if you live in Vicenza or nearby (like Padua, Venice or Verona), definitely try to do them all. If you are visiting for a short amount of time, then pick one or two in order to escape the city and savour Italian nature, culture and lifestyle from a different point of view. Monselice is a lovely medieval walled city about three-quarters of an hour away from Vicenza. In the past Venetian nobles would spend their summers there in order to escape the oppressive heat of La Serenissima. The gem in Monselice’s crown is its castle. Originally built back in the 11th century, nowadays with its mixture of styles and influences the castle resembles a veritable architectural patchwork. A visit to the castle is highly recommended (the room with the fireplaces had me swooning. Who knew that a fireplace can be such an exquisite work of art?!). If you are after some light exercise though, then follow the cobbled road starting from the castle and then leading all the way up the hill to the Seven Churches Sanctuary. 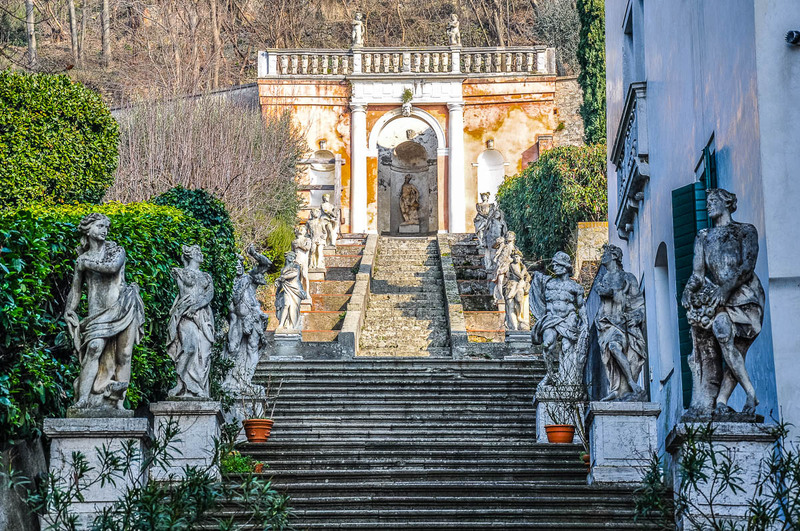 You will pass by the splendid Villa Nani Mocenigo and admire (from behind the closed gate) its fabulous stone staircase and its stone wall adorned with statues of dwarves. Continue up the cobbled road past the town’s Old Cathedral (Duomo Vecchio, also known as Pieve di Santa Giustina). Take a short break there to see the artwork inside this Romanesque church. Next you will pass through the Porta Romana – an old straight-from-a-fairytale gate guarded by the statues of two lions. You will feel like you are entering into a magical world. On your right-hand side will lie the whole of Monselice with the Venetian plains and the Euganean Hills in the distance. Continue up the lane which is a well-known religious pilgrimage route. Soon, on your left-hand side you will see a series of small equidistant chapels. They were designed at the start of the 17th century by Vincenzo Scamozzi for the Duodos – a Venetian patrician family. Scamozzi was a pupil of the renowned architect Andrea Palladio and, among other things, completed the Teatro Olimpico in Vicenza, after the death of his teacher. Right after the chapels, you will see the imposing Villa Duodo flanked by a small church – the Sanctuary of Saint George. Together, the chapels and the sanctuary are known as the Seven Churches (Sette Chiese). Visiting them grants you the same papal indulgences as those granted to the pilgrims who have visited the seven Holy Year churches in Rome. Tip: At the very top of the hill (on the slope of which the Seven Churches and Villa Duodo are built) there is a ruined keep known as the Mastio Federiciano (not open for visits). Also, the Sanctuary of St. George contains the relics of Early Christians removed from the catacombs of Rome. It is believed that the bones of St. Valentine are also kept there. In fact, a special ceremony dedicated to the martyr is held there every year on his day – 14th February. Suitable for buggies: Generally yes, although the cobbles and the slope of the hill may make it tiresome to push the buggy. More photos and information: Check the entry for Monselice under number four in this list. Lots of photos of Monselice and the above hike can be seen here. Just over an hour away from Vicenza you will find a splendid waterfall park with several hiking paths of differing level of difficulty. It is a really beautiful green place where, apart from a staggering 18 waterfalls, you can admire some stunning mountain views and even visit caves used by the pre-historic tribes that lived in those corners of what is nowadays the Northern Italian region of Veneto. The waterfall park is a great place to visit and hike, especially on a hot summer day. Make sure that you wear your most comfortable shoes with a good grip as the terrain is hilly and gets muddy close to the water. Wooden railings and steps dug in the soft soil make walking easy and small children should not have any problems keeping up with their parents. 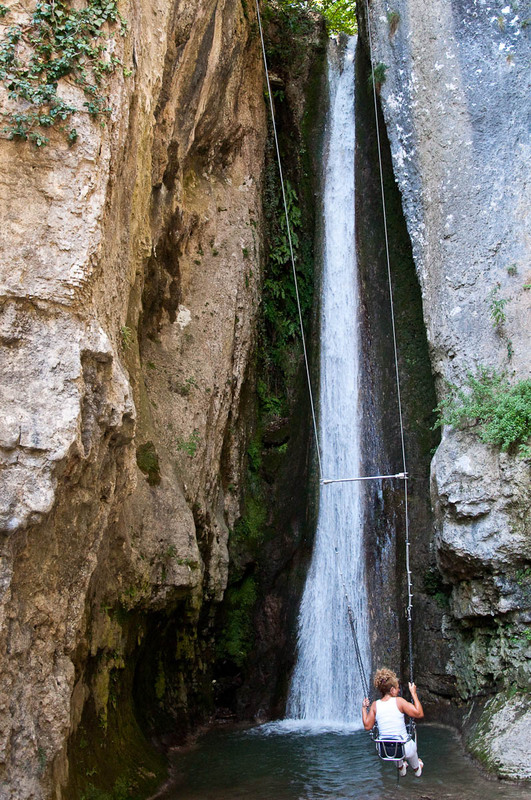 Plus, there is a zipline and a swing allowing you to swing straight towards a huge gushing waterfall. The park is very popular with locals, so on busier days you will need to queue for both the zipline and the swing. Just above the waterfall park is the medieval village of Molina. I fell in love with its traditional houses with slate roofs. Molina is famous for its watermills which are driven by the same springs which feed the waterfalls in the nature park. There is a well-signposted path which you can follow to see several of the local mills (some of them are open for demonstrations on certain occasions) and even a small communal dairy (called malga turnaria in Italian) from the 19th century. Tip: Check this link for interesting information about Molina’s traditions. Price: Free to visit the village of Molina and see its mills. The park has an entrance fee. Click here for prices and opening times. Suitable for buggies: You can use a buggy in the village of Molina and to reach the entrance of the Parco delle Cascate (the path leading to it can be quite steep at times). You cannot use a buggy in the park and on the path leading up to Molina’s mills. More photos and information: Parco delle Cascate and Molina – A Great Day Out in the Province of Verona. Hiking the Excalibur trail in the plateau of Tonezza del Cimone easily turned out to be one of the most cherished and beautiful experiences of my life here in Italy. It is an easy to tackle, yet very, very beautiful circular trail of 2.5 km which takes you through forest and pastures and offers amazing views of the nearby mountain peaks (with Mount Spitz among them). There are ten stations along the way for you to stop at, see and learn different things. Some of these are: the Valley of the Cherry Trees, an old trench, a small stone fort. At the Excalibur station you can see a wooden figure of King Arthur in front of which stands a large rock with the King’s mythical sword stuck in it. Children will have lots of fun trying to pull it out (a truly impossible task). The trail is very well signposted and informational boards (albeit in Italian only) are placed at each station. If you are brand new to hiking and/or have small children and feel like a gentle walk in the woods, this is the perfect trail. To reach the trailhead from Tonezza del Cimone, take the road leading to Folgaria for just over 3 km and park at Baita Pontara – a small restaurant with an adjacent parking lot. 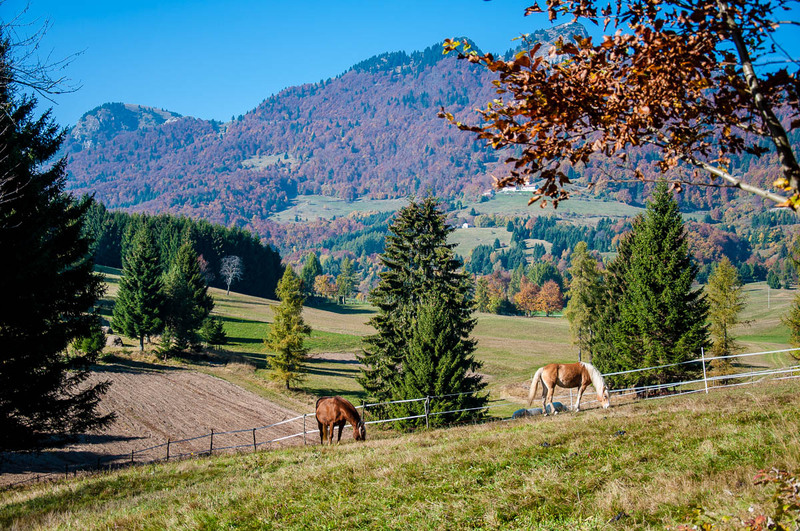 Tip: There are horses in the pastures in the first half of the trail. More photos and information: Have a look here. It is an Italian website (so you can use Google Translate, if need be) with lots of photos showing the trail. This is a beautiful walk with more than a tinge of romance to it. 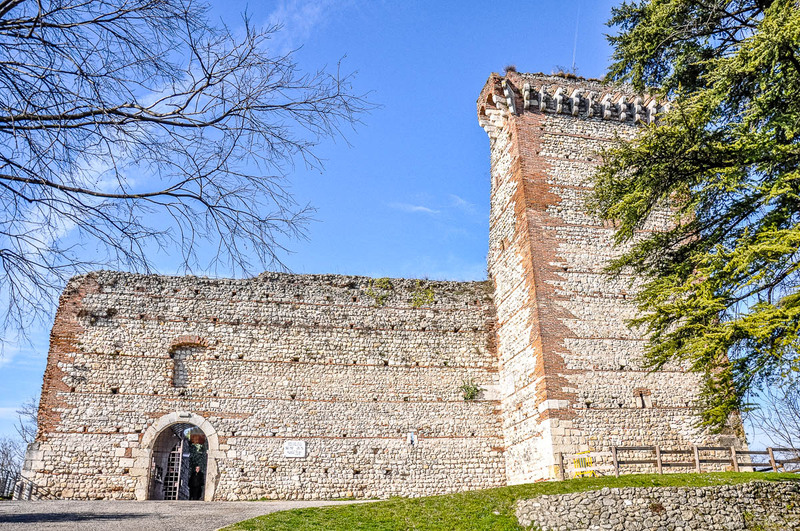 The two castles which crown the hill above the small town of Montecchio Maggiore are said to have inspired the quill of Luigi da Porto – the original author of the tragic story of Romeo and Juliet. Built in the 14th century by the Scaliger family – Lords of Verona – the castles are about 300 m from each other and were originally called Castello della Villa (nowadays known as Romeo’s Castle) and Castello della Bellaguardia (nowadays known as Juliet’s Castle). You can drive all the way to the top of the hill (although the hardy locals prefer to walk it there), park in the extensive parking lot by Romeo’s Castle and spend some time inside it climbing up its tall tower and admiring the stunning view which it affords you. Then take a leisurely walk up the road to Juliet’s Castle. Surrounded by green vineyards, it is a short but very nice way to ensure that you get your weekly dose of exercise. Spend some time exploring this castle too, as it also affords you unforgettable views. There is a seasonal restaurant in Juliet’s Castle, if you are in need of refreshments. Tip: The two castles and the area between them become a huge medieval settlement on the 1st May each year, when the locals celebrate La Faida – a historical reenactment honouring the story of Romeo and Juliet. Several other events are held there through the year, so keep an eye on the local event listings. Also while walking towards Juliet’s Castle, you will see on your right-hand side the entrance to the caves from which the white Vicenza stone used to be extracted. Guided tours of the caves are offered through the year. Price: Free to enter the castles and walk from one to the other. The tours of the caves are paid for. Suitable for buggies: Yes. The road between the castles is tarmacked. More photos and information: For photos of Romeo’s Castle, have a look at the end of this blog post. For photos of Juliet’s Castle and La Faida, click here. 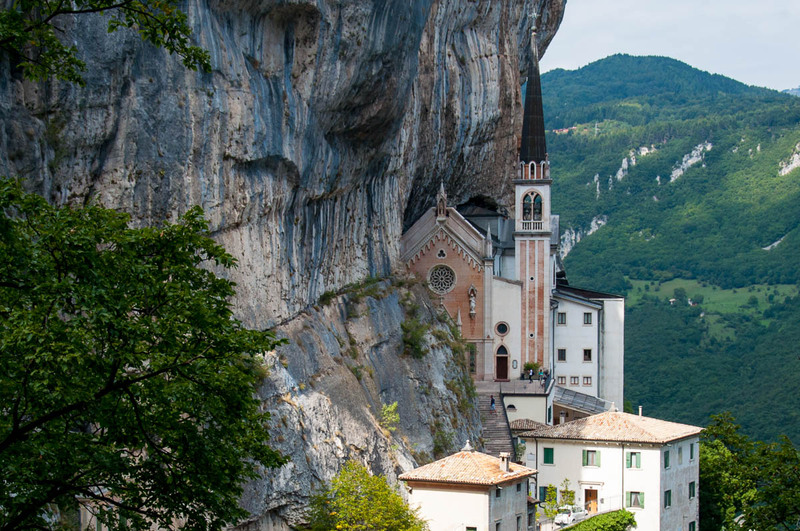 Partially hewn at 774 m height in the rocks of Monte Baldo, the Sanctuary of Santa Maria della Corona has been a place of pilgrimage for almost five centuries. To reach it, you need to drive to the village of Spiazzi (the journey allows you to admire some of the most beautiful panoramic views of lake Garda), park your car there and then follow on foot the meandering sloping road. It will take you from the small square ‘Giovanni Paolo II’ all the way down to the Sanctuary. Along the way, you will come across an alpaca farm with a stall selling different items made of their thick wool. Stunning views of the surrounding rocks, outcrops and mighty hills will open right in front of your eyes. You will be amazed at how deep below runs the valley through which the river Adige glistens in the sun. Houses and vehicles will appear like tiny dots in the great distance. And then, at regular intervals along the road, you will see a series of bronze sculptures cast by Raffaele Bonente – an architect from Verona. 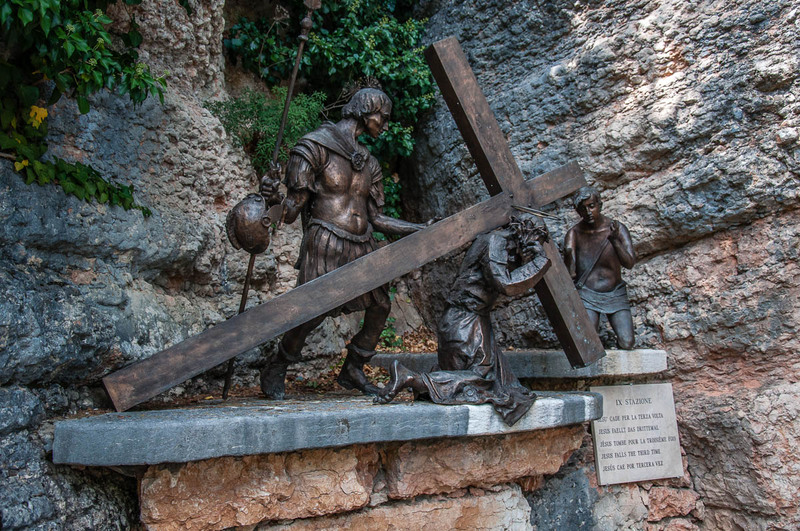 They depict the Stations of the Cross – a fourteen step pilgrimage following the progress of Jesus Christ on his way to his crucifixion. The sculptures are very impactful, so prepare to spend some time in a quiet contemplation of each one and to answer the many questions your child may have. Another option to reach the Sanctuary is by taking the steps which lead from the top of the road all the way down. If you are in peak shape, consider a third, much more strenuous way to reach the Sanctuary: the old pilgrimage path. Start from Brentino Belluno at the bottom of the valley of the river Adige (Val d’Adige) and scale the 1540 steps along the ridge of Mount Cimo. Tip: When the bells of the Sanctuary start ringing their sweet tune, stop, listen and drink the majestic views in. You will feel suspended between heaven and earth and the melody will make you feel happy and grateful to be there at that particular moment in time. Suitable for buggies: Yes, if you follow the meandering road from Spiazzi down to the Sanctuary. However, please, note that the slope of the road is significant. Also, a shuttle bus runs from Spiazzi to the Sanctuary at regular intervals, so you need to be aware of potential traffic. The other two ways to reach the Sanctuary are not suitable for buggies. More photos and information: My First Glimpse of the Sanctuary of the Madonna della Corona. Situated on a narrow promontory jutting into Lago di Garda, Sirmione is, without doubt, one of the most picturesque towns on the shores of Italy’s biggest lake. Spending a day there is always a delight, so make sure that you walk Sirmione from one end to the other in order to see as much as possible while indulging in some light to moderate physical exercise. Start by exploring the medieval Scaliger Castle (also known as the Sinking Castle, as some of its mighty defensive walls stretch into the blue waters of the lake). Go up its ramparts, walk on its cobbled ground, admire the views over Sirmione and lake Garda from the castle’s highest points. Then, walk through the pedestrianised historical town all the way to the entrance of the thermal baths Terme Catullo. From there follow the road surrounded by exclusive hotels and olive groves to the ruins of what once were a huge Roman villa known as the Grottoes of Catullus. Tip: For maximum enjoyment, try doing this walk in early spring or middle to late autumn. 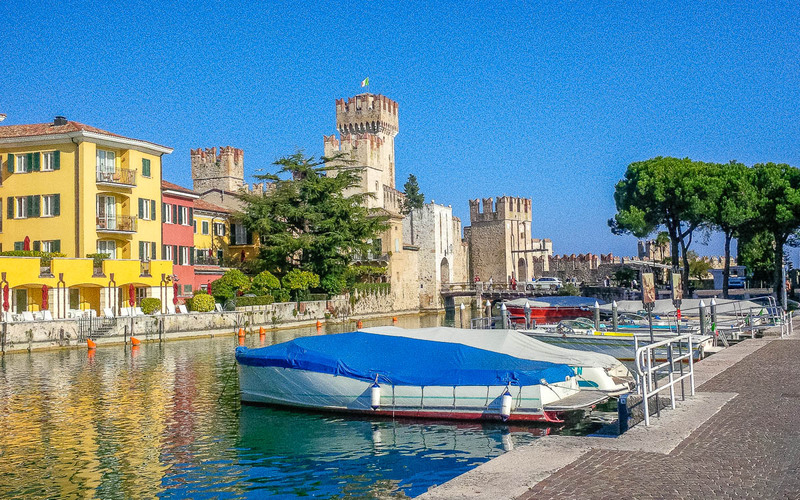 Sirmione is a very popular tourist destination and in summer it heaves with people, while parking can be a huge problem. Also, on a hot day, walking there can get quite exhausting, so always bring plenty of water with you. Price: Free to walk everywhere. The castle and the Grottoes are paid for. Also, check the most current opening hours of the castle and the Grottoes. At the time of writing this article, the castle is closed on Monday afternoon and the Grottoes – all day Tuesday. Suitable for buggies: Generally, yes. If visiting the castle, you will need to leave the buggy at a designated place. In town, there may be some steps along the way, depending on which path you choose to follow through Sirmione. When exploring the Grottoes of Catullus, make sure that you follow the smooth pedestrian paths through the ruins for ease of navigation. Otherwise, the ground is covered with gravel which could make pushing the buggy quite difficult. Soave is one of the loveliest medieval walled towns you can find in the Northern Italian region of Veneto. Surrounded by an almost intact massive defensive wall, the town has a cobbled historical centre dotted with beautiful houses and many traditional eateries. 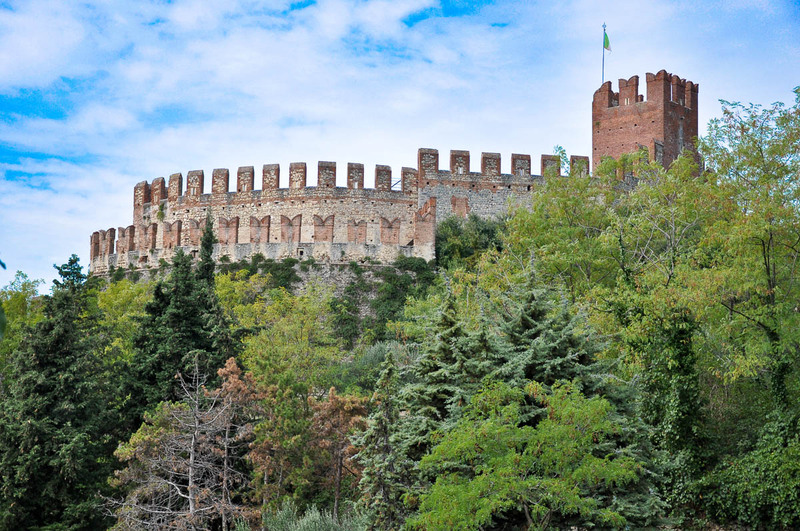 The gem in Soave’s crown is a hilltop castle reminiscent of a tiered wedding cake. Less than 40 mins away from Vicenza, Soave is a great day trip. As you walk from the centre of town all the way up to the top of Mount Tenda, on which the castle is built, you will enjoy some stunning views. Leave your car at the parking lot just outside of the medieval wall and enter Soave through one of its mighty old gates. Then, walk through Soave’s centre stopping to admire the local architecture and to take pictures of the San Lorenzo Cathedral. Its yellow Renaissance facade looks stunning against the blue sky. Just a few steps up the road from the cathedral, you will see Soave’s Palace of Justice which was originally erected in 1375. From there, turn right. A pebbly, slightly steep road will lead you past the 15th century Dominican Church of Santa Maria di Monte Santo and then will turn left and begin the ascent to the castle. Once you have reached the castle’s crenelated walls, stop for a visit and explore its three courtyards and rooms with preserved frescoes. 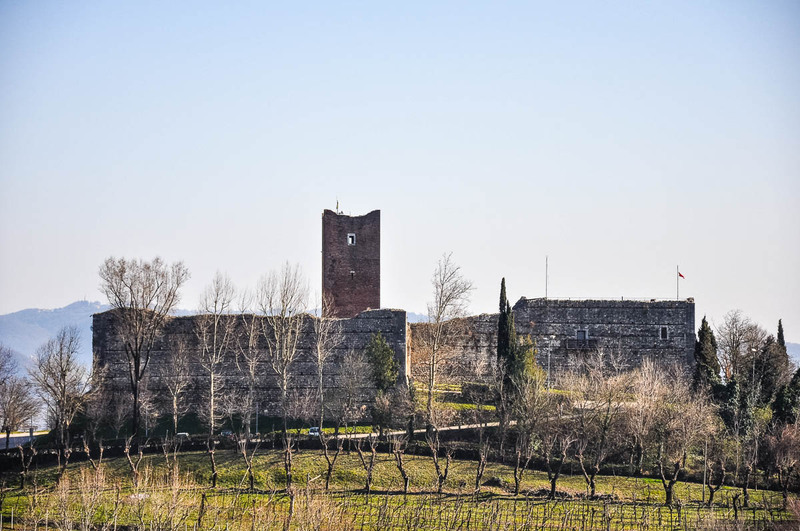 Behind Soave Castle (built on the ruins of a Roman fort) you will find lush vineyards and olive groves. A small park offering great views of the defensive walls is an ideal picnic spot. 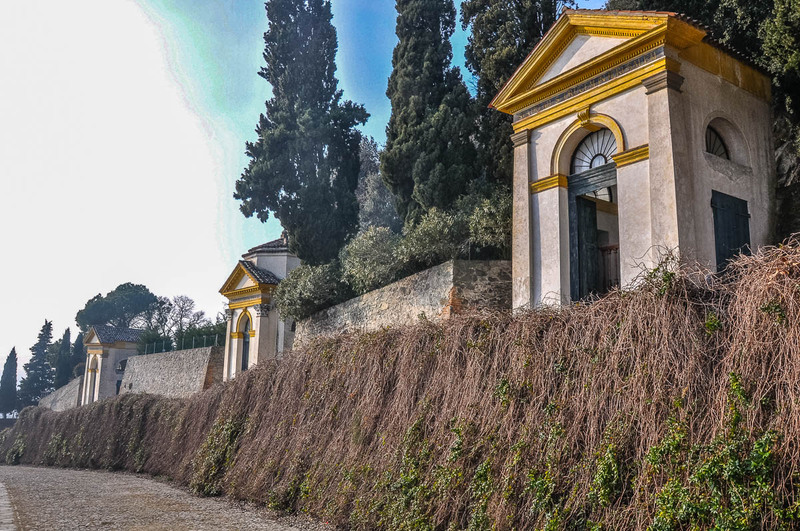 On the way back and just past the castle, vary your itinerary by walking down the long line of steps which cut across the adjacent Baccio Zanella Park. Tip: In summer it can get really hot on the pebbly path leading up to the castle from Soave’s historical centre. Make sure that you have enough water for each member of your walking group. Price: Free to walk on the path and visit the churches. There is an entrance fee for the castle. Bear in mind that the castle closes for riposo and it is also closed all day Monday. Suitable for buggies: Speaking from experience, I can tell you that it is not very easy to push a buggy up the steep and pebbly path leading up to the castle. It is possible, but be prepared for the physical effort. The path leading through the vineyards and the olive groves behind the castle is not tarmacked and it is very difficult to navigate with a buggy. The steps leading down the hill, if you choose to go back via the adjacent Baccio Zanella Park are steep and not suitable for buggies. 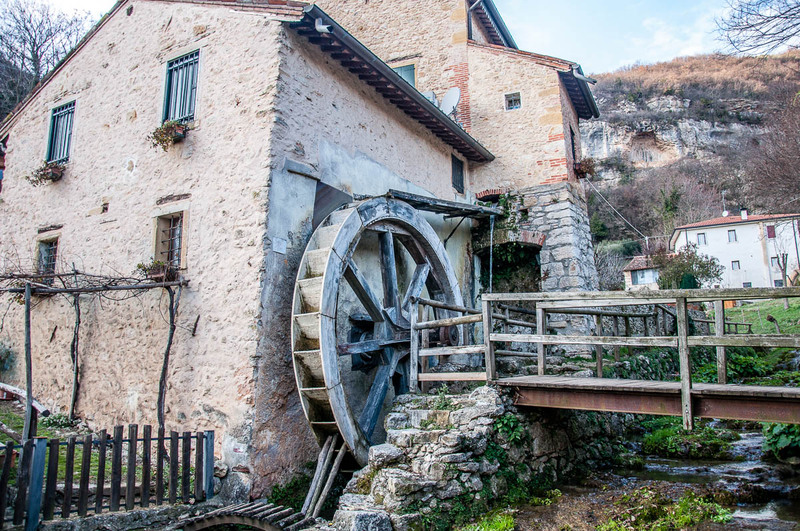 A beautiful hike among centuries-old watermills awaits you just half an hour away from Vicenza. 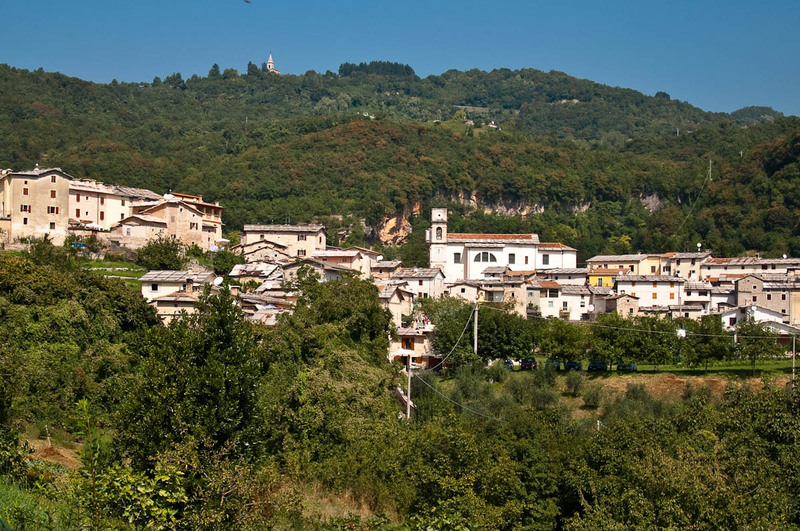 Mossano is a picturesque little village in the Berici Hills. There is ample parking available just at the start of the village. From there, follow the road leading down to a small valley and, once at the bottom of the hill, follow the narrow path which snakes up leading you from one ancient watermill to the next. There are signs and informational boards along the way. Some of the original watermills have been demolished through the centuries, but many are still in working order. It is quite wonderful to stop for a little bit at each to admire their huge wooden wheels energetically turning with the tiniest trickle of water. The path leads uphill and often includes steep uneven steps. It is a lovely workout. 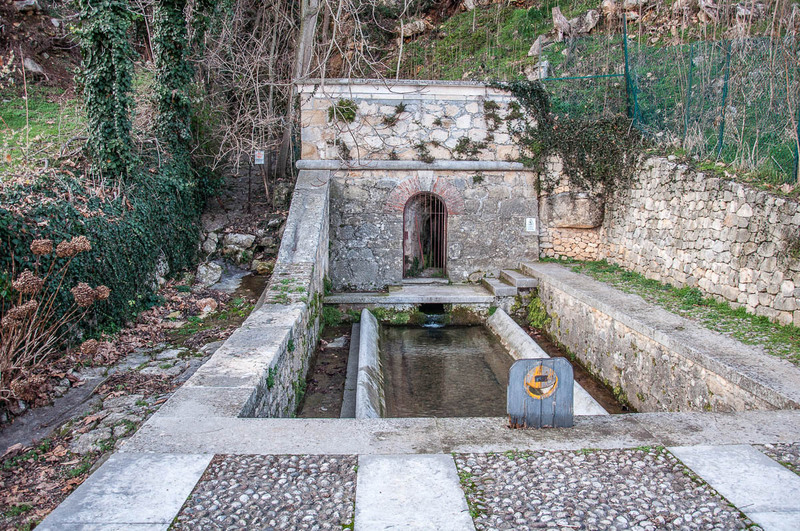 At the top of the hill you can see the Fontana di Mossana – one of the most abundant springs of water in the Berrici Hills. Look up at the steep rocky faces above you and you will spot the ruins of the Prigioni di Mossano. This is a structure cut in the rock with rooms, windows and connecting staircases. The Mossano Prisons are private property and can be visited as part of a guided tour only. Seeing them from afar is still quite impressive. Finish your hike in the bar opposite Mossano’s beautiful church. The bar’s premises offer a stunning view over the Venetian plains and the Euganean Hills. Tip: This is a beautiful hike any time of the year. In spring, when everything blooms, it is particularly lovely. Once you reach the last mill on top of the hill, you need to walk on the edge of the road in order to get to Mossano’s church. Pavements are narrow and/or missing in parts, so make sure you keep little children close to you. Suitable for buggies: No, as the path sneaking past the mills is steep and uneven. 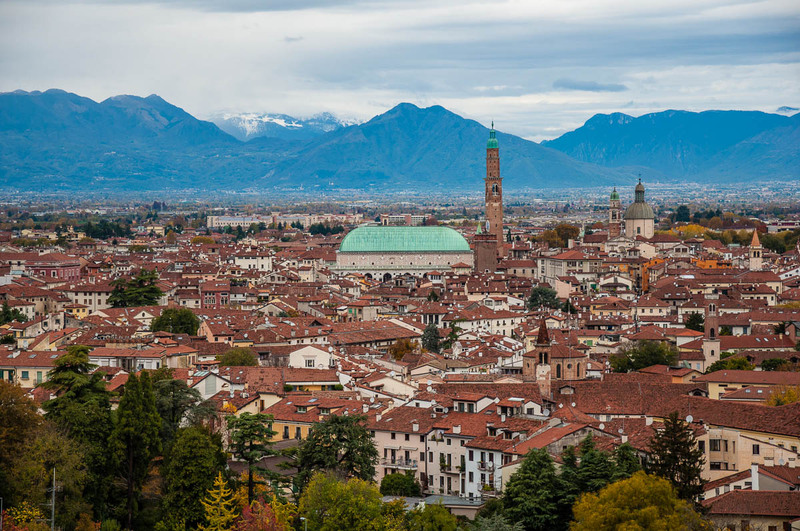 This is a great walk allowing you to admire stunning views of Vicenza and to learn more about the illustrious history of this lovely Italian city. Start from the splendid Piazza dei Signori and then walk to Piazza delle Erbe on the other side of Palladio’s Basilica. Continue past Pasticceria Venezia, cross the San Paolo bridge over the river Retrone. 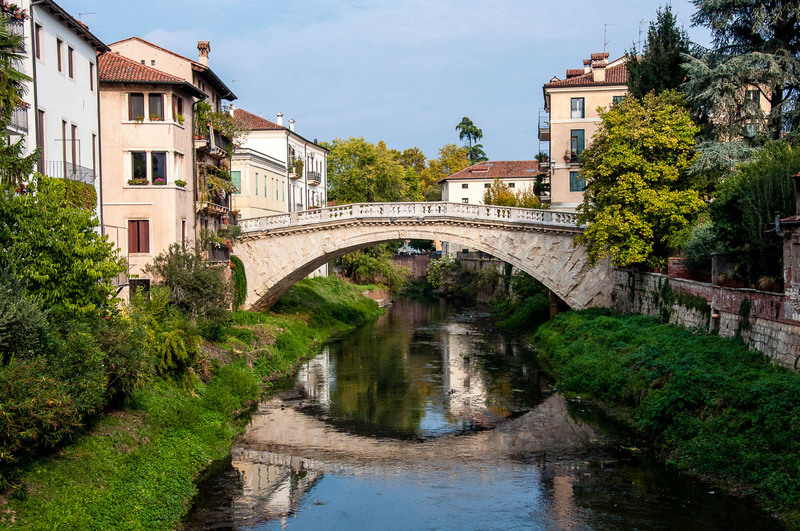 Don’t forget to look to your left as you cross the bridge in order to admire from the best vantage point the most beautiful bridge in Vicenza. Called San Michele, it is a vaulted arch stone bridge which was built at the start of the 17th century. Continue down Contra Santi Apostoli to where it meets with Piazzola San Giuseppe. Note the amphitheatrical shape of the houses on your left hand side. This is where the ancient Roman Amphitheatre of Vicenza used to stand and all consecutive buildings which were erected there followed its original outline. 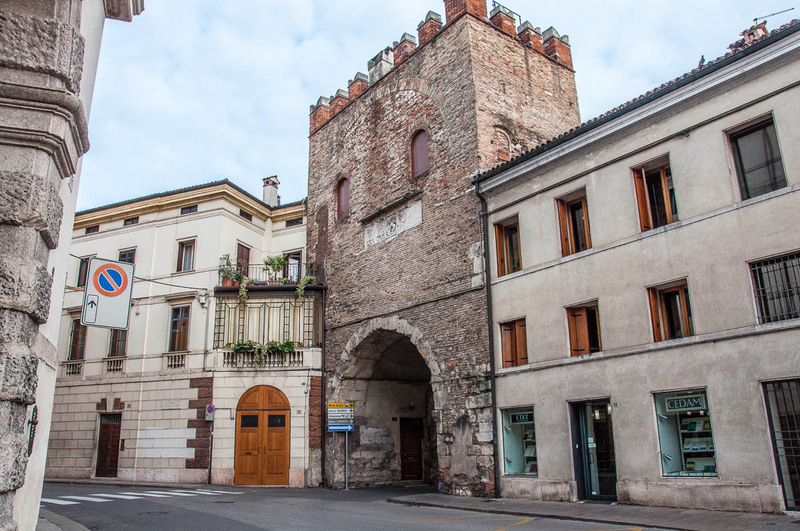 Walk through the Porton del Luzzo – one of the oldest gates in Vicenza’s defensive wall. Here you have two options. Turn right and walk down Contrada San Silvestro until you reach its crossing point with Viale Risorgimento Nazionale. Cross and turn left onto Viale Dante Alighieri. Then walk the short distance to where the Portici of Monte Berico begin. The Portici are a massive arcade which follows the steep incline of Mount Berico all the way to its top. Built in the 18th century, the Portici are 700 metres long, have 150 arches and were designed by the architect Francesco Muttoni. Stay on Contra Paolo Lioy, followed by Contra Pozetto, Contra del Guanto, Contra Santa Chiara, Contra San Tomaso and Contra Santa Caterina. It sounds complicated, but you just need to keep walking following the curve of the streets and they merge one into the next. You will reach Viale Risorgimento Nazionale and right in front you will see a huge arch with a stone staircase leading up the hill. Cross Viale Risorgimento Nazionale at the zebra (this is a heavy traffic road, so exercise caution) and start your ascent. There are 192 steep steps, so take it easy the first time. Once you conquer the steps (known as Le Scalette in Vicenza) you will enjoy some of the loveliest views of the City of Palladio. 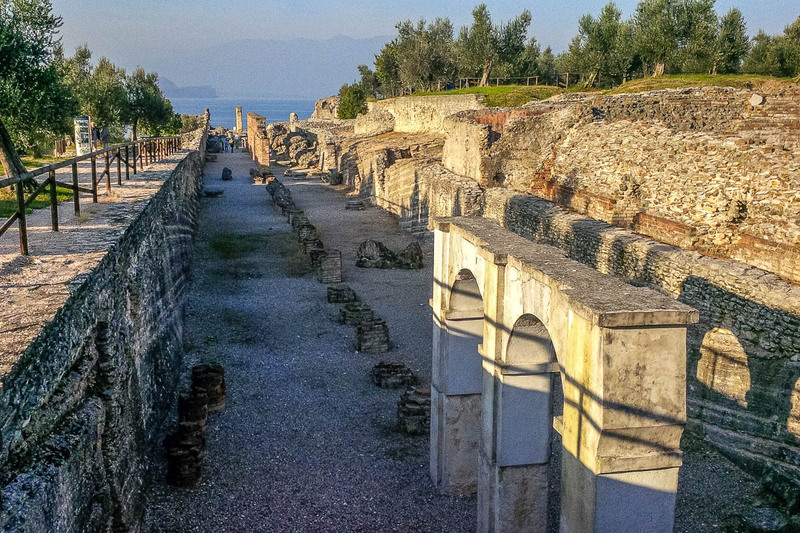 Continue following the road and you will come across the top portion of the Portici from point 1 above. 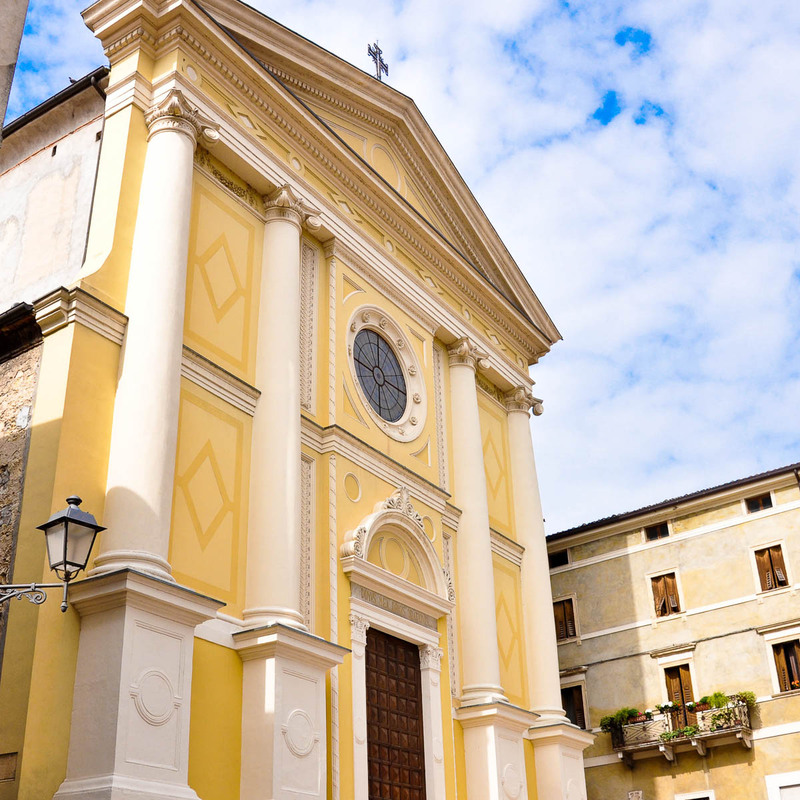 Once you reach the top of the Portici you will see the splendid Church of St. Mary of Mount Berico – A Marian shrine built on the spot where the Virgin Mary appeared twice in the 15th century. Spend some time visiting the church and the adjacent monastery. Admire Vicenza from above some more from the hilltop terrace known as Piazzale della Vittoria. Then continue on Viale X Giugno all the way to the Risorgimento and Resistance Museum. Retrace your steps to return to Vicenza’s town centre. Tip: Don’t miss the huge painting ‘The Supper of St. Gregory’ by Veronese in what once were the refectory of the Church of Mount Berico. Price: Free to walk and visit the church. There is a fee to visit the museum. Suitable for buggies: Yes, as long as you don’t take the second option and avoid Le Scalette. Also, be aware that the incline of the Portici can be quite steep, so hold onto the buggy at all times. If you are an avid birdwatcher and/or are looking to explore another lovely corner of the Northern Italian region of Veneto, head over to Noale. Noale is a picturesque medieval walled city. 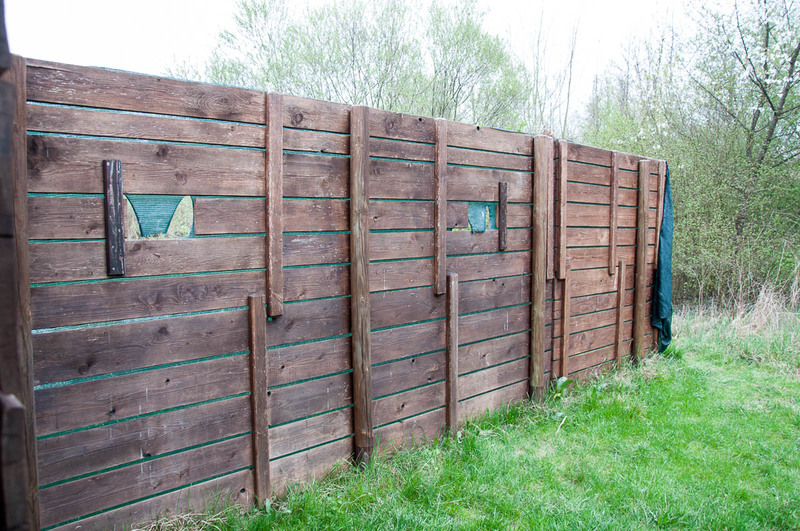 Most importantly, less than a kilometer outside of the city you will find a green oasis where many birds come to nest. Called Cave di Noale ( cave meaning ‘quarries’, as formerly there were clay quarries there) nowadays this is a quiet refuge with two lakes, birdwatching shelters and picnic spots. The oasis is managed by the WWF. You can spend half a day exploring Noale and then walk over (or drive) to the oasis to circumnavigate on foot its lakes, have a nice picnic and observe the birds in their natural environment. It is a great day out. Tip: To maximise your walking distance, make sure that you also circumnavigate on foot the ruins of the ancient castle of Noale. Also, bring binoculars and a camera to the oasis in order to spot/capture in pictures as many birds as possible. Price: Free to walk and visit the oasis. Suitable for buggies: Yes, in town only. So, here it is! 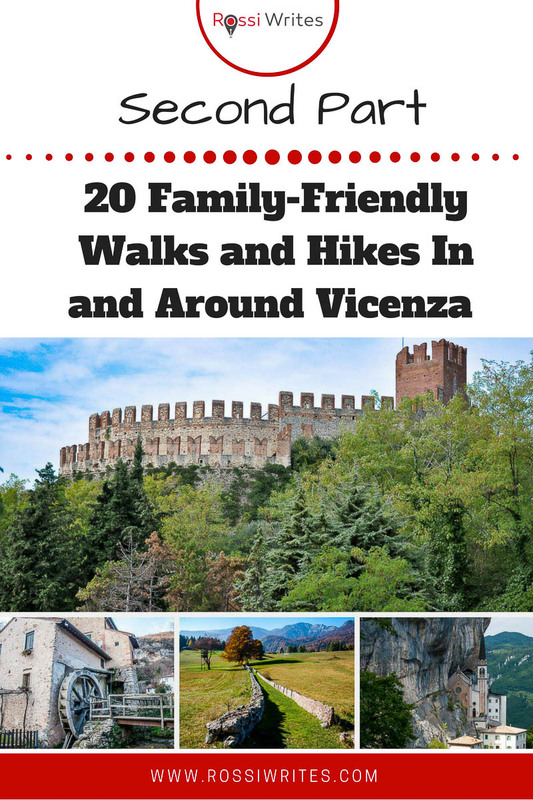 The second part of my twenty suggestions for family-friendly walks and hikes within an hour and a half from Vicenza. I hope you find them useful! Let me know which ones of them you plan to complete or have already ticked off. 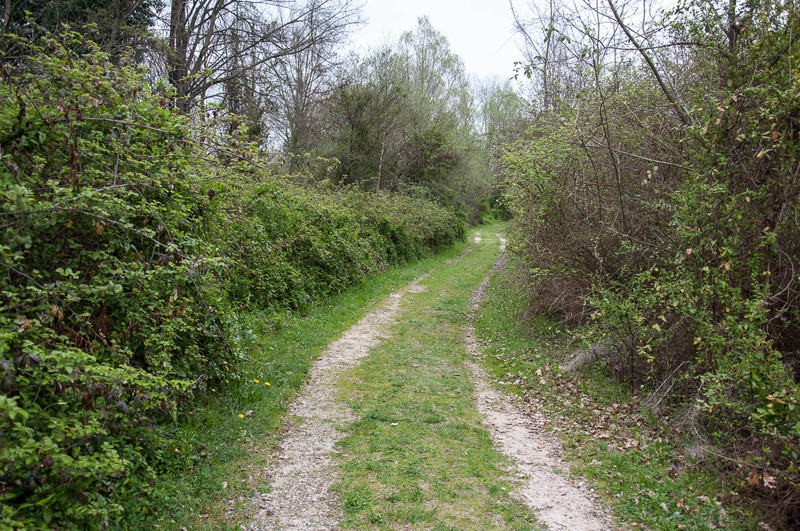 Also, please, share with me your own suggestions for yet more walks and hikes in the Veneto.